I've been waiting to watch Parks & Recreation for such a long time that it might have easily been a huge disappointment, with the weight of all the expectations I had of it hanging over its head. But turns out I love it! Now it's showing both on Netflix and on the BBC, and I have been power-watching. I'm currently well into series 3. The show doesn't offer a loud, ha-ha kind of humor, but I am often chuckling away while I'm watching it. All the characters are quirky and quite loveable in all their strange, wacky ways. What about you? 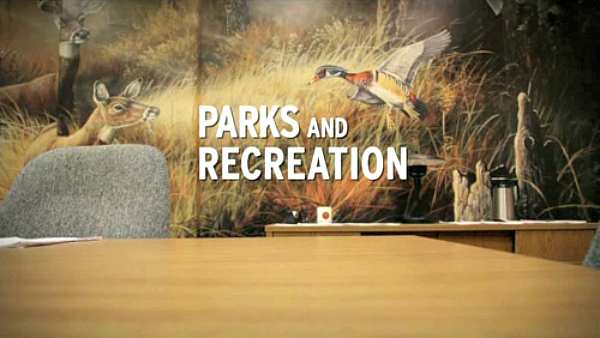 Do you like Parks And Recreation? Who's your favourite character? What's your favourite show to watch? Do you get as obsessive over box sets or Netflix as I do? Tell me about it! Parks and Rec is one of my favorite shows, it's hilarious! I've actually never watched it. I will have to check it out now that I know you love it. i am OBSESSED with P&R! this is one of my favorite scenes— i quote it all.the.time! i've seen every episode and sometimes nick and i have entire conversations with just quotes from this show. wish i could go back and watch it for the first time— there is so much fun in store for you!